I’ve always loved Japanese gyoza. Something I always order when I go out for sushi. 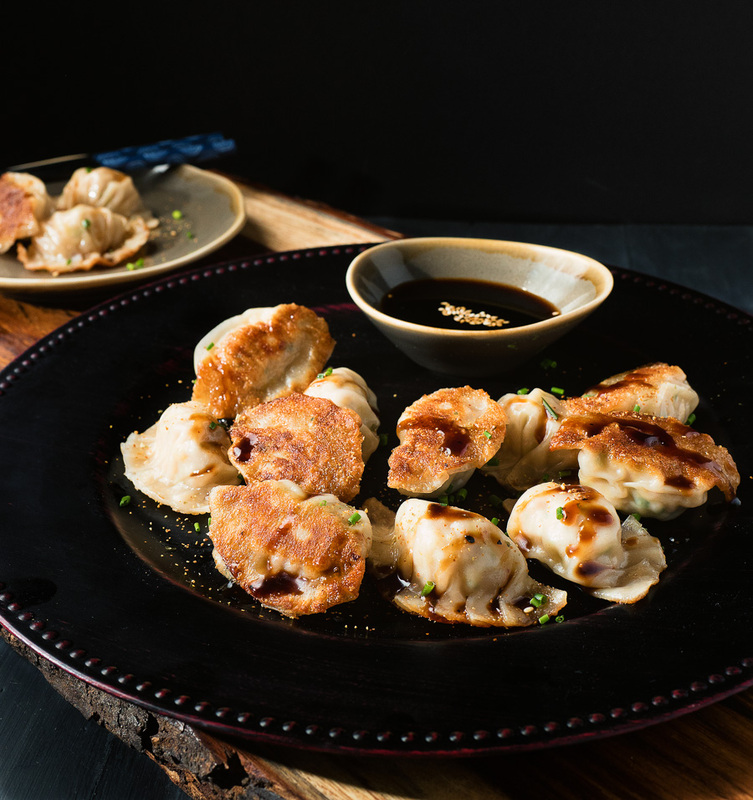 Gyoza or shumai – I can’t get enough. Something about that little fried and steamed dumpling dipped in a simple soy rice wine vinegar mix just makes me smile. If they make you smile, read on. They aren’t that hard to make either. Only problem is when you’re making them you wind up making 30 or 40 of them so it’s not a bad idea to have a few friends over to help you eat them. And maybe help you make them. Those folds take time. Not a ton of time once you get it but time. Or you can just say forget the folds and go with a simple seal. Pretty sure the they don’t taste any different without the pleats. Maybe the pleats will go out of style. You never know. Look what happened to mens pants. 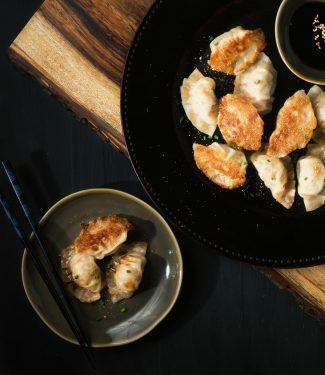 Japanese gyoza are a great starter to any asian inspired menu. Cook them in batches and serve them up as soon as they come out of the pan. Slice the napa cabbage as thinly as you can. Mix in 1 tsp salt and let the cabbage stand for around 15 minutes. Working a big handful at a time, squeeze the water out of the cabbage. Do this over the sink. Squeeze hard to get as much water out as possible or your gyoza will be soggy. Add the chives, ginger, garlic, togarashi shichimi, miso and sesame oil. Mix thoroughly. You especially want to distribute the garlic and ginger evenly. Now mix in the pork. Get you hands in there and really, really mix. Go nuts. This is important. The cabbage keeps the pork from getting tough as it cooks. Have a small bowl of water handy. Place a wonton wrapper on a cutting board. Shape a small ball (like a big marble) of the filling and place it in the middle of the wrapper. Wet about 1/2 the edge (circumference) of the wrapper with a bit of water. Just dip your finger in the bowl of water and rub the outer edge of the wrapper. Fold the wrapper over the filling to form a semi-circle. Pinch the middle of the semi-circle where the two halves touch. Now make those irritating little pleats. Do the side to the right of the point where the two sides are pinched, then do the left. Google a video for this. It helps. Or be a trend setter and just don't bother. Pre-heat a frying pan with a tight fitting lid over medium heat. Non-stick won't brown the gyoza as well as a regular pan but they do have a tendency to stick a bit so decide what your priorities are. Add 1 tsp vegetable oil and 1 tsp sesame oil. Making sure you don't let the gyoza touch, carefully place as many as will reasonably fit in the pan and fry, flat side down (pleated side up if you bothered) for about 2 minutes. Check to see how they are browning. When they are just a bit less brown than you want, add a 1/4 cup of water. Be careful. You are adding water to hot oil. That's generally not a good idea. It will splatter. Cover, turn the heat to medium-low and cook for about 2-3 minutes. Remove the lid, turn the heat back to medium and cook until the water has evaporated. If you are into food safety, check the internal temperature with an instant read thermometer. You want the inside to read at least 160F. I've never seen it not get there but it's always a good idea to check. Sprinkle with togarashi shichimi if you have it. Serve with dipping sauce. Nira is a flat asian garlic chive. It's a really nice flavour but if you can't find them in your Asian market green onions will do just fine. Togarashi shichimi is a Japanese chili red chili mix with orange peel, sesame seed and pepper. It comes in little bottles and is available in most Asian markets. In appetizer, japanese, pork. Bookmark the permalink. Your food blog is my favourite of all the food blogs I have ever followed. You feature really interesting recipes and your writing is clean and simple. You don’t make us scroll through dozens of annoying recipe beauty shots to get to the recipe itself. I have made several of your recipes and they all turned out beautifully and have become part of my regular dinner recipe rotation. Thank you! Patricia – thank you so much for your kind words. I do try to to keep it simple and stick to the recipes and the food – without 100 pictures and the story of my life. Really appreciate you’re taking the time to comment and I’m so glad the recipes are working out for you!